There’s no such thing as not playing. Music has rests in it. So, you’re on a rest and the music will begin shortly. If you’re interested in musicianship, aural skills, and ear training, most of the practice you do probably revolves around listening to sounds. Whether you use individual notes, chords, rhythmic parts, complex timbres, or practise active listening in real music, you probably spend your training time listening. As well you should! But perhaps we’re forgetting a complementary part of developing our ears for music? Claude Debussy said that music is in the space between the notes, and it’s important to remember that silence can be just as important as music. In the midst of a week filled with all kinds of exciting music, most of it new to me, I went for the first time to an “adoration of the blessed sacrament” service. Though I was raised Catholic, this is a part of the Catholic tradition I’d never really come into contact with before. The service started with some prayers spoken together, the sacrament was presented at the altar, and then for the rest of about an hour we simply knelt and prayed. In silence. This was a marked change from the rest of the services during the week which were lively, musical and generally full of youthful exuberance. We simply knelt, and prayed, in silence. That’s not to say that the world was silent around us. Though the chapel stayed quiet, we were in the midst of a busy dorm building, and there was chatter from time to time, along with some feint noise from the street. It became a particular task to focus on the silence, guarding against these distractions, and I was reminded of two interesting and useful approaches to nurturing inner silence and quieting both inner thoughts and sounds from the outside world. The levels he defines range from the most distant sound at the furthest level “I don’t know” to the closest, most intimate at level “I think”. I think the outermost two levels of this model, “I know” and “I don’t know” are perhaps the most interesting. They represent sounds that you perceive but whose source you can’t see. The “I know” level is for sounds where you immediately know the cause, where your brain automatically constructs the obvious explanation for what you’ve heard. In the outermost level, “I don’t know”, our brain does not (or cannot) have an explanation of what caused those sounds. So unlike the meiow of a cat outside, for which your brain instantly constructs the explanation “there is a cat outside”, some sounds defy instant classification and so do not quite become a part of our mental model of the world around us. When you become aware that you are listening to some noise in your environment, you can include that listening in your awareness in the same way that you pay attention to the sensations in your body. You can simply feel the sound as it touches your ear, and you can note, if you wish, “hearing, hearing, hearing.” You can let the sound be a wave, just like the breath is a wave. When the sound passes, then you can return naturally back to the breath. 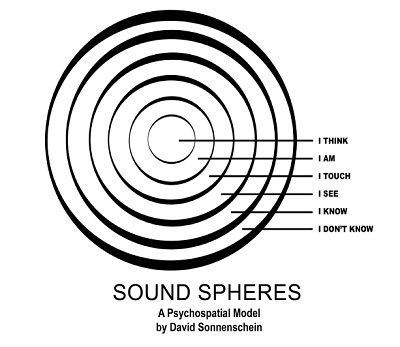 Essentially he’s advising that you try to keep the sounds abstract, to keep them in a domain where they can be more easily dismissed than when they have been connected to an explanatory mental model. This is particularly interesting guidance for somebody who’s been doing ear training for audio bands and EQ. In that training you are very much learning to disassociate from a lot of the instinctive analysis your brain does on sound, to allow you to listen in a more abstract way. Rather than hearing “drums + guitar + bass guitar” you in a sense relax your ears and try to hear the sound as a whole – and then listen for its presence in various parts of the audio spectrum. Thus dissolving the neat classification-by-instrument model your brain has constructed, so that you can listen in a different way. For my part, I still have a way to go in learning to control my hearing. The techniques mentioned above have helped me, and in a time of quiet focus I can employ them quite effectively. But it will be a while yet before I feel able to use them to limit my mental response to unwanted sounds in more everyday situations, out in the normal world. I believe this is a key part of developing one’s ear. It’s not enough to be expert in analysing all the sounds that you hear. One must also be in control of which sounds the brain spends effort on, and be able to disable that analytical inner ear when its continual instinctive and reactive modelling is unhelpful or unwanted. Global and focal listening meditations also make us conscious of our extraordinary ability to filter sounds, as when we are in a room full of noise and focus in on one person’s voice. The ability to create “silence” selectively by focusing our listening is one of the greatest miracles of listening.